Tourists browsing around Mexico’s souvenir shops often see a painting – reproduced on everything from wall hangings to Tee-shirts – of a heroic-looking man in medieval armor and a beautiful, dark-haired woman, both on a heroic-looking white horse. History buffs might recognize the man as Hernan Cortes, the Spanish conquistador who led the invasion of Mexico. The woman played a key but controversial role in the conquest. But who was she? The invaders called her La Malinche – meaning something like “the captain’s woman” — but her name was really Malinalli. Born around 1500, she originally lived in an Aztec territory of eastern Mexico, perhaps in what’s now the state of Veracruz. There, people spoke Nahuatl, the common language of the seven Aztec tribes. After her father died, legends say, Malinalli’s mother remarried and her new stepfather later sold her to some passing traders. She was eventually re-sold to a Mayan tribe down the coast in the modern-day state of Tabasco, where she learned to speak their language. The two different languages are important to the story, as is Tabasco. From there the legend jumps to 1519 and the start of the conquest. It began when Hernan Cortes’ fleet of 12 ships left its home base in Cuba to go looking for riches around Mexico’s nearby Yucatan Peninsula. The Spaniards first showed up on the offshore Mayan island of Cozumel, which turned out to have few riches. But they were able to free a shipwrecked Spanish priest who’d been held captive by the Mayans. His treasure sack unfilled, Cortes sailed around the tip of the Yucatan to a spot in the Mayan territory of Tabasco he’d heard was loaded with gold and silver. But when the Spaniards got there, they only thing they found was an army of Tabascans – who greeted the invaders with showers of arrows and spears. After slugging it out for a few days, the conquistadores made friends with the local folks. They gave each other gifts to seal the deal. Cortes gave his ex-enemies a sack of pretty green and blue beads and a large cross fashioned from one of the Mayans’ sacred ceiba trees. They gave Cortes a dozen or so hens, baskets of fruit and 20 female slaves. One of the slaves was a young 15 year old girl named Malinalli. Perhaps trying to get rid of Cortes, the Tabascans told him he’d find a golden bonanza in a city way up the coast in the land of the Aztecs. So off the fleet went to the rich city (now Veracruz) carrying Cortes, the ships’ crews, 508 troopers armed to the teeth, 16 war horses, a pack of attack dogs, the freed priest and the 20 slaves. Along the way, Cortes figured out how to communicate with the Nahuatl-speaking Aztecs. First, he learned the priest, Jeronimo de Aguilar, had picked up the Mayan language while he was in captivity. Then, someone told Cortes about Malinalli, who not only spoke Mayan but also Nahuatl, her original language. Promoted from slave to interpreter, she was given the Christian name, Marina. When they landed at Veracruz, Cortes ran across a group of Aztecs who’d come from their capital city of Tenochtitlan (now Mexico City) to collect taxes from the local Totonacas. They communicated like this: The tax men first talked to Marina in Nahuatl, then she told Geronimo what they said in Mayan, and then Geronimo passed this along to Cortes in Spanish. Here the plot thickens. Marina, it seems, held a grudge against the Aztecs, remembering that they’d sold her into slavery. So, as the tale goes, she kind of let it slip that the Aztec tax collectors had mentioned something about golden temples in Tenochtitlan. The next part of the story is right out of the 1947 hit movie, Captain From Castile, in which Cortes, played by Cesar Romero, moves his army inland on a 280-mile march to the capital. 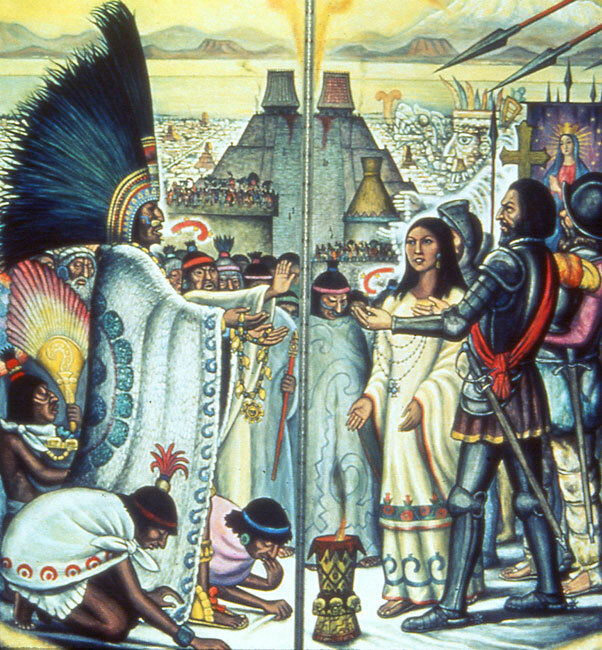 In the picture, emissaries from Moctezuma show up along the way to tell Cortes there was nothing worth looting in Tenochtitlan, so he might as well go back to Veracruz. Of course the messages were delivered to Marina who may not have translated them completely accurately. After awhile, Marina learned Spanish, thus freeing Jeronimo to go back to saving souls. One can only wonder what Cortes really said to Moctezuma by way of Marina, and what Moctezuma told Cortes again, translated by Marina, when the two leaders finally met on the outskirts of Tenochtitlan. In any event, Moctezuma, somehow believing Cortes was the long-lost great god of the Aztecs, handed over the city without a fight. There was a fight later on, which the Spaniards won. The country was officially conquered a few years later. And how was Marina rewarded for her contributions? Cortes named a volcano after her, built a house for her in a suburb of Tenochtitlan, fathered a baby with her and then let her marry one of his troopers when he was reunited with Mrs. Cortes. Footnote: Souvenirs with the paintings of Cortes and La Malinche on them are mostly bought by foreign tourists, because La Malinche is generally reviled as a traitor by Mexicans, akin to America’s Benedict Arnold. Still, others believe she was a heroine who helped free Mexico from its bloodthirsty rulers and who aided Cortes in bringing Christianity to the country. This entry was posted in Aztecs, Cortes, Malinche, Uncategorized. Bookmark the permalink.